GNU Arch was created and written mainly by Tom Lord. GNU Arch 1 (also known as tla) is currently maintained by Andy Tai. 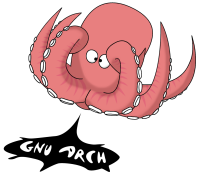 GNU arch can be found on http://ftp.gnu.org/gnu/gnu-arch/ [via HTTP] and ftp://ftp.gnu.org/gnu/gnu-arch/ [via FTP]. It can also be found on one of our FTP mirrors. The latest release is version 1.3.5.